Homelessness in America dwindled away after WWII, when the GI Bill and generous social programs seemed to finally get on top of a problem that had been with the country since its inception; but starting with Reagan's mass de-institutionalizations and cuts to social services, homelessness has only grown, a phenomenon America answered by criminalizing being alive, and pretending not to notice homeless people in encampments at the edge of more and more US cities. The criminalization of homelessness is only possible because of the vilification of homeless people: Catholic Churches installing drizzlers to stop people from sitting outside them; prison sentences for charging cellphones; criminalizing treating homeless people humanely. The answer -- semipermanent homeless camps -- are only possible because we pretend they aren't there: we don't even count homeless people. But the real answer, the one supported by evidence, that actually works, and costs less than anything else, is incredibly simple: pay for housing. Chris Herring's long history of homelessness in America is an important perspective on how we got here, and how having a certain number of people that society simply treats as surplus to requirements has once again become the new normal. Armies of homeless people have changed American politics in the past, marching on Washington and demanding justice. Today's homeless world has more possible ways of organizing than any other cohort in history, between mobile phones and library Internet. The question is, in demanding their humanity, will homeless people be able to outmaneuver the forces that profit from their presence, from the private prison industry that charges a large fortune to provide substandard housing to homeless people; to commercial public-private partners who provide shelters that are nearly indistinguishable from prisons, and cost small fortunes; to the large employers who benefit from the downward pressure on wages exerted by the presence of homeless people? ...For most homeless campers the really crucial difference had less to do with personal comfort than with the more ineffable matter of dignity. 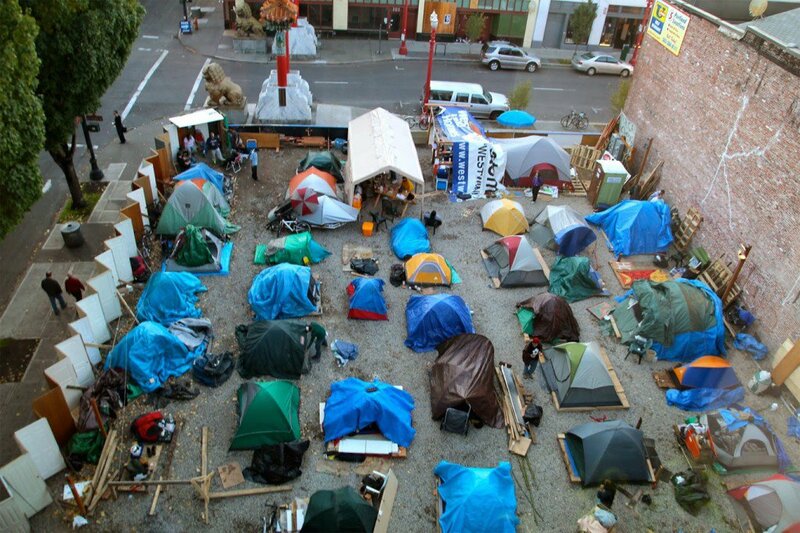 To this point, consider the names of the legal encampments: “Dignity Village,” “Village of Hope,” “Community First!,” “Right 2 Dream too,” “Opportunity Village.” In describing why they preferred camps to shelters, some deployed the right-wing rhetoric of “self sufficiency” and “no government handouts,” while others used vaguely anarchist terms like “autonomous rule.” In the Village of Hope, in Fresno, Brad, a longtime truck driver before becoming homeless at age sixty, explained to me that “in the shelter you’re forced into dependence. You’re served food, people clean up after you, and you have no control over your day-to-day schedule. In the Village, we’re not a burden to anyone.” Many of those I interviewed referred to fellow campers as their family, and some emphasized that it was the first time they’d ever lived anywhere with a sense of community.